The Urbane Sienna Bamboo diffuser is both practical and beautiful. The combination of glass and dark bamboo create a soothing, sleek design that features a diffusing time of up to 9 hours. This diffuser is a perfect addition to any home or office space. Option to turn the color rotating background off. I love the diffuser. It is the first one that I have used that is easy to put the water into it without spreading drops as you take the top off. I love rocky Mountain oil products and have purchased from RMO frequently but will have to stop as they are charging exorbitant amounts for postage. I have 4 diffusers, But this one is my new favorite. 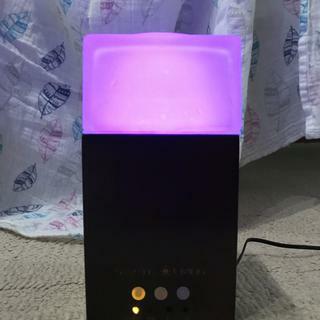 Love the colors, It is quiet, and diffuses very nicely. It's quiet, it looks beautiful, it's the perfect size (medium), and it actually diffuses the oils quite nicely. I'm glad to have found this diffuser. Highly recommend it! I have a few diffusers around our home and I like this unit a lot! It's very fancy in design and works well. I like the natural materials and separate buttons for light and mist. I'd definitely recommend. I'm very satisfied with this diffuser. Puts out good plume of mist, easy to operate, no distortion of scent, lasts 5+ hours on continuous mist. The only improvement I would personally prefer is for the intermittent cycle to be different; like maybe 5 minutes on and 5 minutes off. Don't want to cast any shadows though . . . this is a quality product. This diffuser works great! It is small, attractive, and covers a large area with the scent of oils. I would definitely buy again! I highly recommend this product! This diffuser does what it’s supposed to do. I’m a little dismayed that it is top-heavy. Three times now one of my kids has knocked it over. Otherwise, it’s fine. I do love this diffuser and it’s very beautiful. Only 4 stars because it was wobbly one of the plastic nobs underneath is not the same as the others causing it to be unstable. I did contact Rocky Mountain oils about This they offered to send a return label and when they received it would send a new one, this obviously makes complete sense but since I was dealing with all of us being super sick so I really didn’t want to be out a diffuser for however long it would take for this process and decided to keep the wobbly diffuser. So that’s where I’m at. It is beautiful though. But $60 is a lot to end up with an unstable diffuser. So far I like this diffuser, has a very strong output and its nice that the light can be turned off, set to one color or rotating. I’m not 100% sold on it yet. It arrived scratched up a little, but I don’t think it affects the operation. I was disappointed because it looked so much better in the picture. I do like the glass top and the lights seems more subdued than other diffusers we’ve tried so that part I do like. So we’ll see how it does over time. Wasn’t too happy that it arrived kind of scratched up, but it doesn’t affect the operation. It's a nice looking unit, but in the one I received the hole of one of the buttons was too small and the button would get stuck when pressed (it slooooowly extends by itself). I hope with time it will get better. No remote which I knew when I made the purchase. I don't care for the 2 separate tops. One is plastic for the diffusing and the glass top goes over it. It doesn't seem so sturdy. I wish the plug wasn't on the bottom and was on the back instead. I do like the different colors that it puts off and it puts off a good diffuse smoke. The buttons are all stuck and I have to unplug it to get it to turn off. The lights and the timer buttons don't work either. It was neat when it worked as advertised. I’m mostly giving this 1 star because the buttons on my diffuser kept getting stuck. I finally gave up and had to unplug it to turn it off. The diffuser is very pretty and I loved that it has an intermittent option on it. The water reservoir is not really big however that is stated in the product details. I would have liked it to put off a stronger aroma, I felt like I had to put a lot of drops in, at least more than the recommended. That could however simply be personal preference. For a small space I think it would be great. It is possible mine was just a defect, but unfortunately I had to return it. The return process was very easy and customer service was as quick to respond. I love all my oils I buy through RMO, the diffuser, was just not a win. Can you turn the light completely off? BEST ANSWER: Yes, the lights can be off while the diffuser is running. Yes but there will still be a little light showing it’s on. Yes you can turn off the light or change colors. Does this diffuser have automatic shut off? BEST ANSWER: I don't think so. I've had to shut mine off every morning because it's still running. Under "Care and Maintenance", the last point says the unit will automatically shut off when the water level gets too low. Yes it does have auto shut off. Gave it to my mom as a gift. She loves it. Yes, it does and it works very well. I love mine. It's great it can use tap water, but, can you just use distilled water & thus avoid any mineral build up to begin with? BEST ANSWER: Yes, you can used distilled water in the diffusers. I'm pretty sure that's not going to be a problem. I use distilled water on the cold mist humidifier for the same reason. Yes! I have a filter system in my home that worked wonderfully. It's as good as distilled water. I am not sure as I have only used tap water. How does this difuser difuse the oil? Is it hot or cold? BEST ANSWER: This diffuser is considered an Ultrasonic Diffuser that doesn't use heat or cold. Using a diffuser is easy: Fill the diffuser with water to the recommended line, put 5-10 drops (more or less as needed) into the diffuser and then turn it on. The ultrasonic technology produces vibrations at a high frequency, turning the water into mist. As you breathe in the aromatic mist, the oil's beneficial properties are immediately absorbed into your body. Cold. Under the frosted glass top is what looks like the top to a baby bottle. Under this is a well that holds the water and oil. It does not heat the oil so there's no comprising the integrity of the oil or it's properties. Never hot or cold. Just room temperature. I just got mine in the mail, there is a think soft plastic between the glass top and the unit do I remove this once I get it or does it need to stay there? BEST ANSWER: Great question! The rubber lining is to help cushion the glass top. What materials are used to make this diffuser? BEST ANSWER: This diffuser is made from Bamboo wood , high quality BPA plastic and has a glass topper. Yes, all of our diffusers are BPA free. Was the wall plug included with your unit? Yes, the wall plug does come included with the diffuser. How's the output on this one? I need to fill a large room. BEST ANSWER: The Urbane Sienna Dark Bamboo Diffuser offers 1,000 square foot coverage. 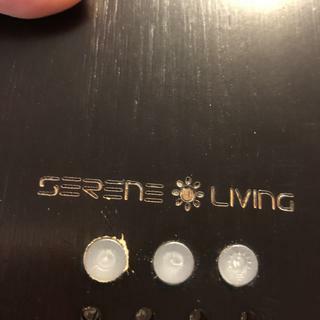 How long are the intermittent cycles and does it spray better than the other diffuser that you sell (the white one) that some are saying has a small opening and does not release much scent? BEST ANSWER: The intermittent cycles are 7 seconds intervals. You can definitely see this mist diffusing from this diffuser. Is it safe to use with citrus oils? BEST ANSWER: Yes this diffuser is perfectly safe to use with citrus oils. what is the color of the background when it is in "off" mode? BEST ANSWER: When the lights are turned off, the glass top is a soft "cloudy" glass. Is the glass part the part that holds the water? BEST ANSWER: The water reservoir is found inside of the diffuser. The glass is the top like the "cap".